Concerned about that chemical, headache-inducing smell that’s so typical of interior paint? LEED’s Low Emitting Materials Credit will equip you with the knowledge to choose affordable, zero-VOC options. Surprisingly, low VOC paints don't always cost more than conventional paints. Volatile organic compounds (VOCs) are high vapor pressure chemical compounds that include some greenhouse gases. VOCs contribute to global warming and are just plain bad for your health. While some VOCs occur naturally from cows and trees, many come from manufactured products such as paint thinners, paints and varnishes and dry cleaning solvents. The process of releasing the VOCs into the air where humans and animals may be exposed is called "offgassing". One common household product that offgasses VOCs is interior paint. The chemicals from these products continue to offgas, even if they no longer smell, and the material may continue to have subtle, negative effects on your health. Exposure to unnatural VOCs lead to sick building syndrome, resulting in headaches, dizziness, allergies, burning skin, eyes, nose and throat. The US Environmental Protection Agency (EPA) reports that VOC concentrations are up to ten times higher inside when compared with outside. Using low emission or VOC-free paints is better for the health of building occupants and earns LEED points. LEED’s Indoor Environmental Quality Credit, Low-Emitting Materials provides guidelines for purchasing the best materials for your building project. According to IEQ credit for Low-Emitting Materials in LEED v4, interior paints and coatings that are applied on site must meet, by volume, at least 90% of emissions criteria and 100% for VOC content criteria per general emissions evaluation. In combination with other emissions mitigating tactics, like purchasing only low emitting furniture or insulations, VOC-free paints can assist in achieving the 1-3 points available for all project categories. Manufacturers now make low or zero VOC paint, which is better for indoor air quality and occupant health. Federal VOC limits are now set at 250 grams per liter (g/l) for flat paints and 380 g/l for others. Some states and regions have lowered the VOC levels for paints that can be legally sold in their areas. California's standards are stringent: 150 g/l for nonflat finishes and 100 g/l for flat. Even tougher is the 50 g/l level for all finishes set by California's South Coast Air Quality Management District (AQMD), around Los Angeles. The Environmental Protection Agency proposed new federal VOC regulations in May 2009. They went into effect in 2011. According to Consumer Reports, VOC levels are set by the California’s South Coast Air Quality Management District (SCAQMD). They limit VOCs in all flat paints to 250 grams/liter (g/l) and 380 g/l in oil-based paint. Low VOC paint has less than 50 g/l flat finishes or 150 g/l for non-flat finishes and 100 g/l for flat.Zero-VOC paint has 5 g/l or less. Identifying a quality, affordable option can be daunting. Find out where to get the cheapest, safest paints while meeting LEED requirements. Does low to no VOC paint cost more than conventional indoor paint? Do you have to pay a premium to avoid the danger of VOCs? Surprisingly, the answer is no. If you shop around, you should be able to find low VOC paints that are comparable in price. According to CostHelper, the price of interior paint can range from $12-50 or more per gallon. Many low VOC options are available at this price point. Zero VOC paints, which have 5 grams/liter or fewer VOCs, are typically more expensive than low VOC or conventional options, and will cost about $30/gallon or more. However, this is still not unreasonable given that conventional paints can cost up to $50 or more a gallon. These products might just skew on the higher end of pricing for conventional paint. To see how much the prices for paint vary, let's compare different types of flat paints with varying levels of VOCs from well-known brands. Each price below is listed as per gallon. The prices for well-known paint brands can vary widely. 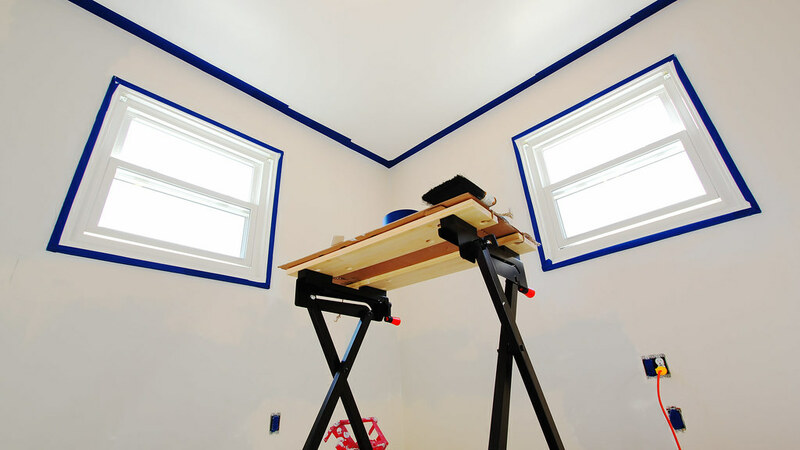 In some cases, zero VOC paint is even cheaper than the conventional or low VOC options. Other characteristics of the product appear to be more likely to affect the paint's price point. With a little research, you should be able to find a low or zero VOC paint that won't cost more and will result in a healthier home. With the help of this chart, you should be able to find the best low-VOC paints for your building project. To help get you started, we have provided a list of no VOC paints that will be suitable for many different building projects and won’t break the bank. Using these paints or finding others with little to no VOC is ultimately the safest choice for your building occupants. Follow LEED’s Low-Emitting Materials Credit requirements for paint and other building products to enhance your indoor air quality. This is an embedded &amp;amp;lt;a target=&amp;amp;#39;_blank&amp;amp;#39; data-cke-saved-href=&amp;amp;#39;https://office.com&amp;amp;#39; href=&amp;amp;#39;https://office.com&amp;amp;#39;&amp;amp;gt;Microsoft Office&amp;amp;lt;/a&amp;amp;gt; presentation, powered by &amp;amp;lt;a target=&amp;amp;#39;_blank&amp;amp;#39; data-cke-saved-href=&amp;amp;#39;https://office.com/webapps&amp;amp;#39; href=&amp;amp;#39;https://office.com/webapps&amp;amp;#39;&amp;amp;gt;Office Online&amp;amp;lt;/a&amp;amp;gt;.